Anne Burton Walsh is a litigator whose practice focuses on all aspects of civil litigation. 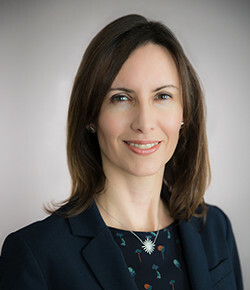 Anne has represented public and privately-held companies in matters concerning contract disputes, corporate governance, shareholder disputes, tax law, intellectual property and antitrust merger review. Anne also has significant experience in conducting internal investigations, including investigations concerning antitrust matters. Prior to joining Aguilar Bentley, Anne was a litigation associate at Davis Polk & Wardwell. Before her tenure at Davis Polk, Anne served as a federal judicial law clerk to the Honorable Shira A. Scheindlin in the Southern District of New York from 2001-2002. Anne obtained her J.D. from Cornell Law School where she served as a Note Editor on the Cornell Law Review.